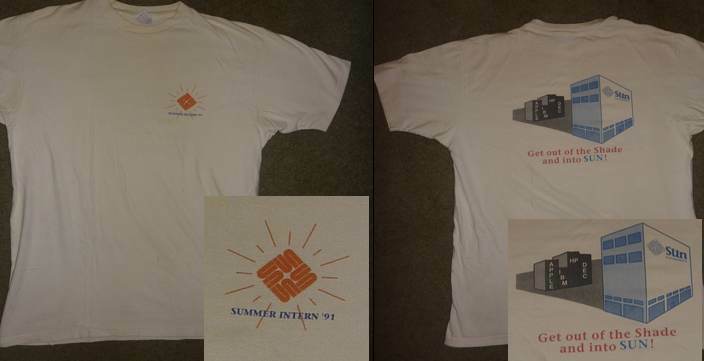 I was a summer intern at Sun Microsystems in 1991, working on Verilog test cases for a 155 Mbps ATM adaptor. I still have the T-Shirt, shown here. Only after we had the shirts made did the intern coordinator really look at it and notice the Sun logo was orange instead of purple, a bit of a gaffe. On the back are shown the companies who we, the interns, perceived as competitors. I've no idea why Apple is there while SGI is not, chalk it up to the exuberant misinformation of youth. 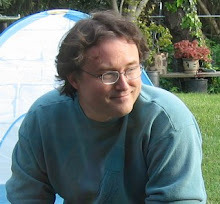 I returned to Sun as an ASIC designer (eventually transitioning into software) and worked there from 1992-2000. The first few years in that span were rough for Sun: the market was just beginning its transition from Unix-based CAD and graphical workstations to Windows NT on x86. Sun managed the transition pretty well, moving the bulk of its business into large SMP servers which the Intel boxes of the time did not scale to. Then came the dotCom boom, which were heady days for Sun. Sun had a tradition of elaborate April Fools jokes. One year a complete hole of miniature golf was constructed in Scott McNealy's office. Another year a platform was built submerged 1" under the surface of the campus lake, with Andy Bechtolsheim's Ferrari parked upon it. 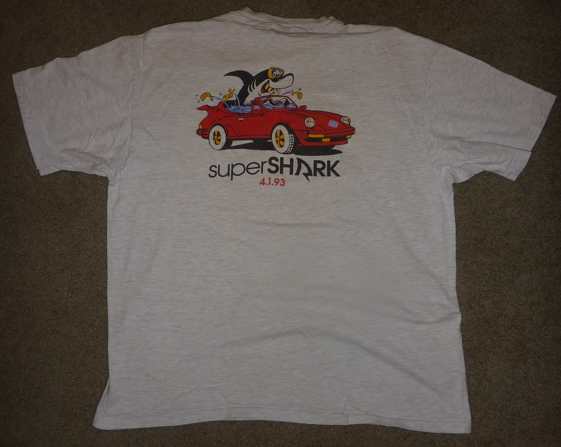 I have the T-Shirt from the 1993 joke: the SHARCStation with superSHARC processor. A complete workstation was submerged at the bottom of a pool, with a scuba diver operating it. I don't remember whether it worked while underwater, but given the culture of Sun at the time I suspect they had come up with a way to waterproof it. Amusingly, I just searched for superSHARC: its now the name of a real processor, a DSP from Analog Devices. I left Sun 10 years ago... but I've missed it. In the mid 1990s it was a heady place, a company at the top of its game with extensive resources to push the industry along. Its corporate culture valued engineers highly, which showed up in lots of little ways but one big one: enclosed offices. Sun would use cubicles if necessary, but the corporate preference was an office with a door. MTS level positions would be doubled up in an office, Staff Engineers and above were allocated a single office. After the dotCom bust, Sun's fortunes changed considerably. The way is now clear for Sun to be purchased by Oracle. Rest in Peace, Sun. These last few years have not been kind.